School was cancelled because of the blizzard. After a moment, I tell my students to open their eyes and tell me to tell me what they saw in their mind. Then, I ask them what happened first... the blizzard or the decision to cancel school? They agree that the blizzard happened first. After all, if the blizzard hadn't happened, there would be no reason to cancel school! Then I tell them that the event that happens first is the cause. The event that happens second is the effect. 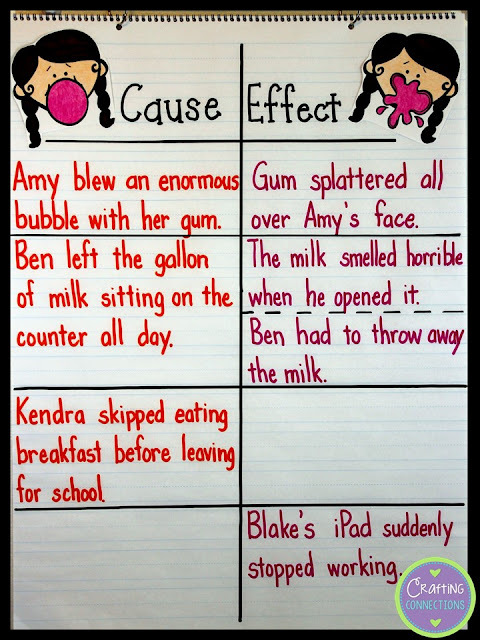 Next, I ask students to visualize this sentence: Amy blew an enormous bubble with her gum, but it exploded and gum splattered all over her face. We have another discussion similar to the one described above. 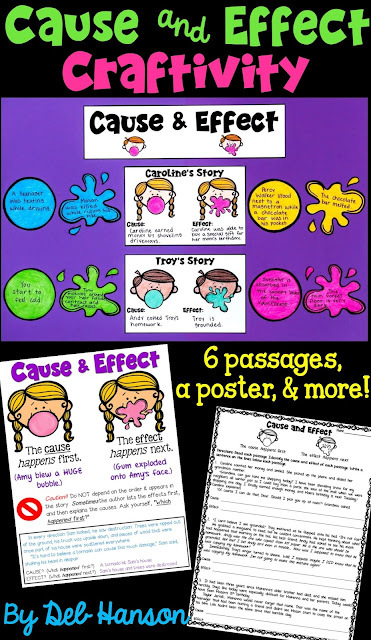 I then tell students that the images of blowing a bubble and gum splattered all over a child's face is what we are going to use to help us remember the difference between cause and effect. When I begin the lesson, my chart actually looks like this. 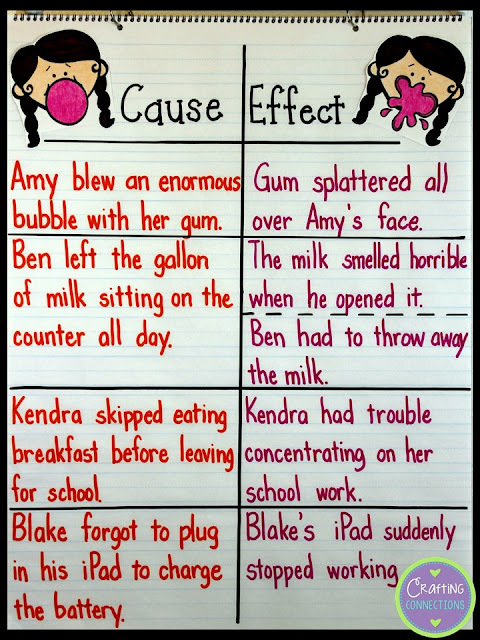 I refer to the second example and explain that a cause can have more than 1 effects (and I briefly mention that an effect can have multiple causes, as well.) Finally, I have my students help me fill out the two empty squares at the bottom of the chart. After introducing the concept of cause and effect with this anchor chart, my third grade students are eager to identify cause and effect with some guided and independent practice! I really like how you use clip art on your anchor chart. 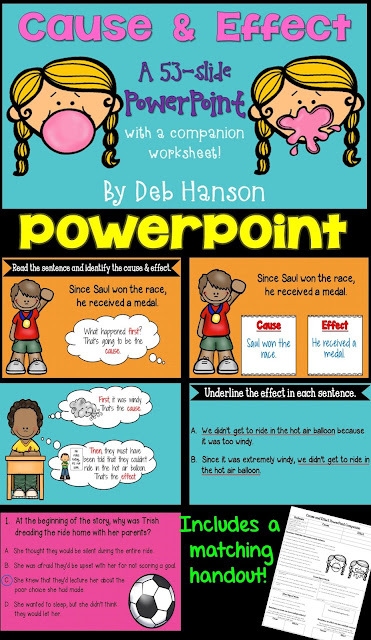 Then you take it to another level with the follow-up activity. That's an amazing concept that I might have to try out! 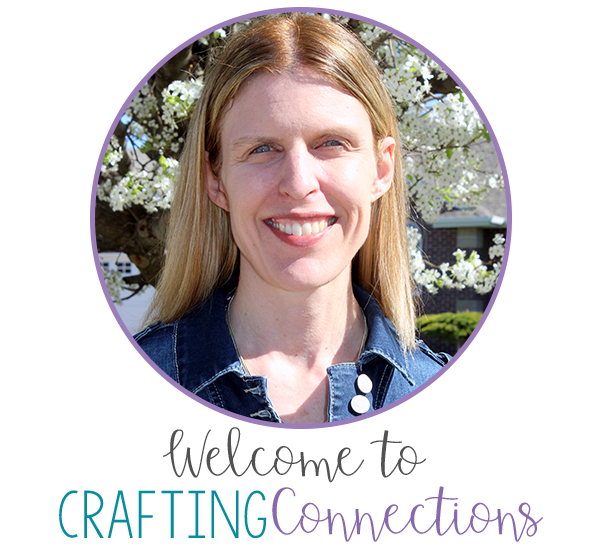 I just need to learn to make craftivities like you - you are truly talented and creative!